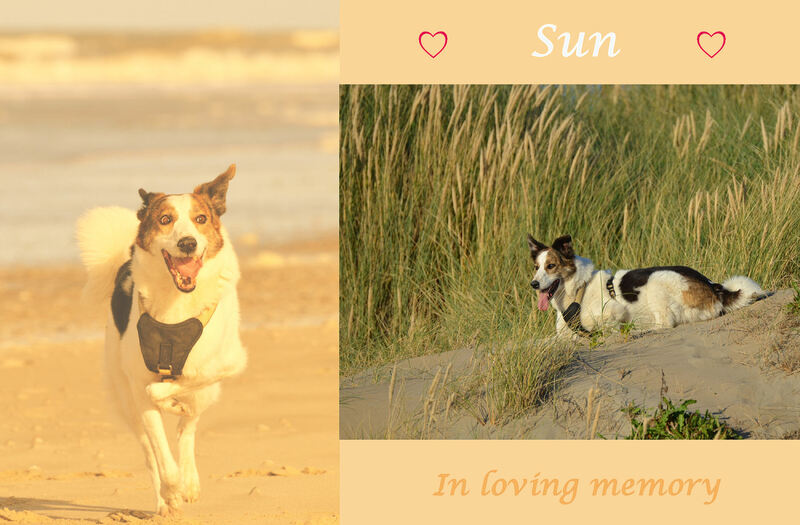 Our beloved friend Sun passed away on November 27, 2015, at the age of 9,5 years. For almost 3 years she was part of our family, she will be dearly missed. 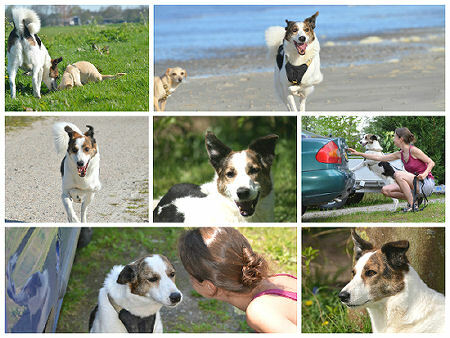 Sun has lived in Romania for about 6 years, partly on the streets and also in a horrible shelter. She was hit by a car and they probably drove over her left front paw, that’s why she walked on 3 paws. Her journey to the Netherlands began in June 2012. First she stayed for half a year in a shelter and at the end of 2012 a family adopted her. But it didn’t go well there, according to these people she was aggressive, unpredictable and had bite incidents with dogs and humans. Even a vet agreed that putting her to sleep was the best idea… Well, that’s where Irene came into the picture. She disagreed with everything, she didn’t see Sun as aggressive, but she saw a dog that was very uncertain and clearly Sun had been through a lot! At first the family was planning on giving Sun back to the foundation/shelter in the Netherlands. But Irene could not let them take Sun back to the shelter, after all she’d been through. So Sun came to our home to join our family. The first idea was to offer Sun fostercare and then find her a permanent home. But well, when an animal arrives at our home they never leave, they are all from the beginning embedded in Irene her heart. In all the years she was with us, Sun has grown a lot. She got all the space she needed and she liked to be on her own a lot. When the weather was nice she liked to be outside for almost the whole day, it was her favorite place to be. She only trusted Irene and Robert, they were her best friends in life. She had a very soft nature and it is a great joy to know she enjoyed her life here with us so much. In the pictures you see mostly only Sun, just how she was, and also some pictures with Irene where they were exploring together and had beautiful moments with each other. At the moment we had to make the decision to let Sun go she was still under anesthesia because of the MRI scan. We decided to not wake her up anymore. It did hurt Irene a lot that she couldn’t say goodbye, once more feel her, look into her eyes and, although she always tells us this a million times, to tell Sun we loved her so much. But for Sun this was the most loving thing we could do, no more pain and go in peace … We were with her at her last moments here on earth and embraced with our love she gently passed away.